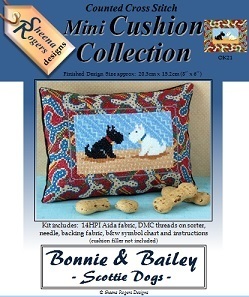 This design features two Scottie Dog friends, with the white Scottie dog (Bailey) being named after a real little poochie with cute pink ears. A tartan style pattern frames the design and this piece could also be framed as a picture if not wanting to make up into a mini cushion. Only whole cross stitch is required throughout, so no fractionals or backstitch needed. This mini cushion cross stitch kit includes: 14HPI white aida fabric, ready-sorted DMC stranded cotton threads on a card sorter, needle, black velvet backing fabric, b&w symbol chart and full instructions (cushion filler not included).